this moong dal khichdi is prepared as a naivedyam for lord ganesha and is made using minimal ingredients and spices. this is a no onion no garlic khichdi recipe. rinse both the rice and dal together for a couple of times in water. heat the ghee or oil in a pressure cooker. crackle the cumin first. add the turmeric powder and stir. add the rice and moong dal. saute for a minute. add 4 to 4.5 cups water. season with salt. stir and then pressure cook the khichdi for 5-6 whistles till both the rice and moong dal have reached a mashable consistency like a porridge. when the pressure settles down, open the lid and check the moong dal khichdi. if its too thick, then add some water and stir well. keep on sim or low flame to simmer the khichdi till you get the right consistency. serve moong dal khichdi with a plain bowl of yogurt or raita. 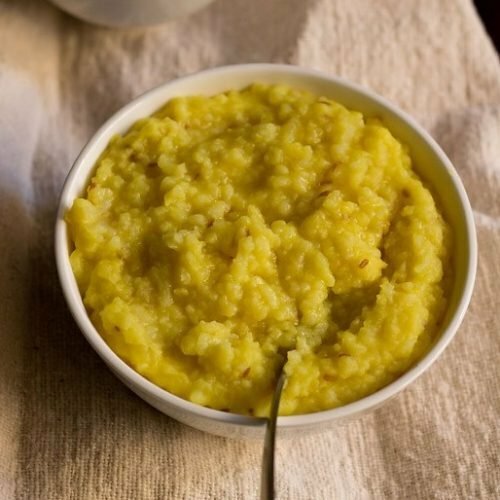 when serving khichdi you can add a 1 or 2 tsp of ghee in the serving bowls or plates. this recipe of khichdi has been made in the pressure cooker. if making in a pot, then soak the mung dal and rice for 45 mins to 1 hour. proceed with the tempering of cumin seeds in the pot. then add dal and rice. add about 5 to 6 cups water and cover and cook the khichdi till the rice and mung dal are cooked till really soft and of a porridge consistency. add more water if required if the khichdi becomes lumpy or too thick. keep on stirring at regular intervals during the entire cooking process.